Although Fredric Jameson is possibly the Anglophone world’s preeminent Marxist theorist, this new book on Capital, Volume One is somewhat unexpected. Jameson is best known for his materialist analyses of cultural phenomena, so it is unusual to see him tackling Marx’s critique of political economy: he is better known for interpretations of science-fiction films than for analyses of the law of value. Jameson himself is sensitive to potential accusations that he can only offer us a ‘literary’ reading of Capital (4). Yet it would be unhelpful to dismiss Jameson as a mere cultural theorist (not least because such a dismissal relies on precisely the simplified base-superstructure model that Jameson has sought to challenge). Whilst it is entirely possible and even legitimate to see his book as a literary reading of Capital, we should do so only if we do not give in to easy stereotypes about what a literary reading might involve. As Jameson argues (4), recent literary theory, in common with much of traditional philosophy, has been preoccupied with the question of representation – and it is this question, he claims, that Marx is grappling with: for Jameson, Capital is above all an attempt to represent capitalism. Jameson’s approach is further justified by the fact that, whatever else it is, Capital is a piece of literature, reliant on various rhetorical tropes and conventions. This is especially true of Part One of Volume One, which is full strange imagery and metaphors (dancing tables etc. ), ironic asides, and a cast of unexpected characters. Jameson convincingly argues that Part One is distinct and separate from the central body of Capital: it is ‘a palimpsest, on whose successive surcharges the whole sequence of Marx’s economic speculations since the 1844 manuscripts is inscribed and then effaced’ (39). Part One should thus be read as a kind of prelude, in which Marx outlines a false problem (namely, the market and exchange), before entering ‘the hidden abode of production’ and beginning his real analysis. Despite – or maybe because – of this, Jameson’s chapter on Part One is the longest and densest in his book. He is particularly interested in Marx’s use of figuration: the use, for example, of religious figures in order to explain commodity fetishism. In part, Jameson suggests, this use of figuration mirrors the processes of reification inherent in capitalism itself: reification, although real and objective (and not merely illusory), is a figural process, in that it is a transformation or translation of one thing into different terms (27). But figuration, claims Jameson, also has a specific role within the architecture of Capital. He presents Capital as the development of ‘a series of interlinked problems or paradoxes’, leading to a series of climaxes wherein the solution to a problem gives rise to some new riddle (3). For Jameson, when Marx turns to figuration then we know that ‘we have reached one of those moments in which the text prepares to solve one of its riddles, decisively to answer one of its organizing questions’ (68). Hence the use of figuration by Marx cannot simply be dismissed as ‘lighthearted and literary self-indulgence’ (36). Instead, we have to think carefully about what Marx is trying to do at these moments – in other words, we have to investigate the ways in which Marx attempts to represent the unrepresentable totality that is capitalism. Following his dense discussion of Part One, Jameson follows with a chapter providing an overview of the main bulk of Capital and a chapter on Part Eight. Like Part One, Part Eight is for Jameson separate from the rest of Capital, though this time as coda rather than prelude, providing us with a genealogy of the preconditions of capitalism. Asking how capitalism came into existence is important, Jameson suggests, not so much for the answers that are given, but because insisting on posing the question reminds us that, far from being an eternal necessity, capitalism has a beginning, and therefore may also have an end (86-7). There follow chapters on temporality, spatiality, and the dialectic, with a concluding chapter on politics. Jameson makes two arguments in particular about Volume One which are likely to provoke debate: first, he insists on presenting it as a resolutely dialectical text; second, he claims that it is not a political book. Readers familiar with Jameson’s work will not be surprised to hear that he presents the Marx of Capital as a dialectician. But they will also know that Jameson’s understanding of dialectics is unconventional and complex. We have already touched on one key aspect of his dialectical approach, namely the claim that capitalism is a totality. To present capitalism as a totality does not mean that its different elements are merely expressions of some common essence. To the contrary, according to Jameson it is in part the need to analyse different levels (economic, political, ideological, etc.) of the totality that calls for the use of the dialectic, which is able to connect these different levels without identifying them. The other key aspect of the dialectic for Jameson is a reliance on dualities, of which many can easily be found in Capital (use- and exchange-value, constant and variable capital, etc.). For Jameson these are not static binary oppositions waiting to be deconstructed: in Marx’s dialectical hands they are set in motion. Whereas binary oppositions such as good and evil call for differentiation and judgement, we cannot easily separate dialectical oppositions in order to come down on one side or the other. Dialectics entails a unity of opposites, wherein a process or system can be one thing and its opposite at the same time. This unity of opposites is central to capitalism – as a system in which ‘progress produces genuine misery, and wealth unspeakable destitution’ (56) – and to Capital, which for Jameson is above all a ‘representation of a peculiar machine whose evolution is (dialectically) at one with its breakdown, its expansion at one with its malfunction, its growth with its collapse’ (142). The claim that Marx represents capitalism as a system that is at once productive and destructive (60) is convincing, if somewhat conventional: the question is whether this needs to be formulated in dialectical terms. Deleuze and Guattari, for instance, make much the same point while sharply repudiating dialectics. The problem here is not so much the claim that Marx’s text is dialectical – although there are plenty of people who would rather see Capital as a haven from that form of thinking: a non-dialectical highpoint sat between the Hegelian indulgence of Marx’s earlier work and the dialectical excesses offered by Engels. The issue is, more specifically, that Jameson does so little to defend his dialectical approach. He touches briefly on the critique of the dialectic provided by analytical Marxism (128-9), but this is such an feeble target (is there really anyone left who needs convincing that analytical Marxism was anything other than a dead-end?) that it only strengthens suspicions that Jameson is not willing to tackle critics of the dialectic. More obvious critics, such as Deleuze, seem somehow to be co-opted into dialectical thinking, though more by implication than by argument (130). In a small book on Marx one would not expect to find an extended defence of Jameson’s dialectical methodology – yet the absence of any such defence risks reinforcing criticisms of Jameson’s previous work that have claimed that his writing tends omnivorously to devour other theories and discourses without due respect for their differences. Jameson’s claim that Capital is not a book about politics is perhaps more controversial and surprising, though it is also more interesting and productive. In the first instance, it means that Capital is not a book of political theory. For Jameson, political theory is always in effect constitutional theory, and as such is always counterrevolutionary (139); it has been rendered irrelevant not so much by Capital as by capital: the state has ‘become so infiltrated by capital’ that it ‘is no longer an autonomous entity’, and so political/constitutional theory has no use any more (140-1). While it would seem churlish to quibble with the claim that today’s Rawls-dominated political theory is irrelevant, this is quite a sweeping dismissal of an entire area of thought. Nonetheless, the wider point is well taken: Marx demonstrates that in capitalism ‘the economic and the political have merged’ (147), and hence political theory as an autonomous discipline is void. Jameson goes further, however, and argues that there is a second sense in which Capital is not political: unlike the work of Lenin – or indeed The Communist Manifesto – it does not offer any advice on political strategy or tactics. It is a book on capitalism as a system, not on the possibilities for human agency (142). What, then, is Capital about, if it is not about politics? 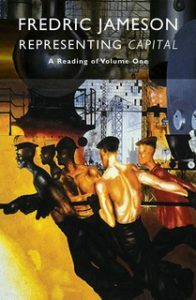 According to Jameson, it is a book about unemployment: Marx’s general law of capitalist accumulation, ‘which posits the identity of productivity and misery’ (127), is about immiseration, or the manner in which capitalism creates an industrial reserve army of unemployed even as it increases social wealth. It is this which allows us to draw contemporary political significance from Capital, even if Marx himself offers us no political prescriptions: ‘Along with Marx’s intimations of globalization, these analyses [i.e. the doctrine of immiseration] seem to renew the actuality today of Capital on a world scale’ (71). For Jameson, this focus on unemployment can help unify the disparate movements that in the past two decades have sprung up in resistance to global capitalism: if we view the world’s ‘multiple situations of misery and enforced idleness’ (151) in terms of unemployment, then we are led to offer revolutionary solutions that challenge capitalism as a whole –precisely because unemployment is not an unfortunate and eradicable side-effect of capitalism, but a structural necessity at the very heart of the capitalist totality. This is an ingenious reading of Capital, but it leads us back to the question of the dialectic and its postulation of capitalism as a totality. For Jameson, the existence of a multiplicity of contemporary resistance movements ‘suggests a multiplicity of viewpoints on the system as such and thereby a general confusion as to what it really is and what form resistance to it should take’ (146). An understanding of the general law of capitalist accumulation, in contrast, can unify these movements by allowing us to grasp the essential dynamic of capitalism. But we can only reach this conclusion if we assume in advance that capitalism is a totality: perhaps instead of reflecting ‘confusion’ about what capitalism is, the multiplicity of viewpoints reflects a multiplicity of sites of conflict and sources of power – in other words, perhaps it reflects the fact that capitalism is not a totality. Whilst viewing the world’s problems though the lens of unemployment may allow us to propose global, revolutionary solutions, it is arguably at the cost of effacing the differential specificity of those problems. Jameson’s book is valuable in that it constantly offers original insights that send one back to Marx’s original text to read it in a new way. At the same time, however, it highlights some of the problems with Jameson’s work – not least its effacement of difference, whether between his own work and that of others, or between different sites and forms of struggle. That is interesting. I will have to read this book, because my impression is that Marx was describing not unemployment, but the tendency toward a ceaselessly unbounded employment.